(Ver 1.3) This is now Part 6 in a series of extremely advanced Bible studies about the Hidden Spiritual Structure of the Family of God. I have covered a tremendous amount of fresh information and several radically new concepts that I cannot take the time to go back and repeat them all. So if you have not read this series from the beginning I would strongly suggest that you go back and start reading with “Part 1”. Then as you go through the lessons, I would also recommend that you take notes on all of the key points. The ultimate goal of today’s lesson is to introduce you to the first woman in the family of God. I guess technically speaking she is my first woman, but she is the last woman in the family of God. But, God says the last shall be first and the first shall be last (Mat 19:30) so I think I am being scriptural to teach them in the reverse order. That was a joke! Today’s lesson will be focused primarily on the identity of just the woman who is titled the “daughter-in-law” in the family of God. You may recall that in the family of 5, we have 2 men and 3 women. While we are not given the ages of the family members, there are younger and older family members implied by the titles given. The son must be younger than his mother and his father and the daughter is also logically younger than her mother and her father. Therefore the most recent female in the family of God is the one that is called the “daughter” who subsequently becomes the “daughter-in-law” and both of these titles you will eventually discover apply to us, the Church of Jesus Christ. That is where we are going today in this lesson. Gen 20:12 And yet indeed she is my sister; she is the daughter of my father, but not the daughter of my mother; and she became my wife. God tells us that Sarah was Abraham’s half-sister and that they shared a common father, but that they each had different mothers. Abram and Sarai were therefore half brother and sister and they later married and became husband and wife. Because Abram’s father Terah is the head of this house, it technically does not matter how many wives that Terah had, they were all still in one family. This is precisely the 5 family members in one family with the exact titles given to us in Micah 7:6. There is a father, a son, a daughter, a mother of a daughter and finally the mother of the son who becomes the mother-in-law when the daughter Sari marries Abram. Do you think this was a coincidence that this occurs in the Bible like that or can you see that it is just a hidden typology like I believe it is? I am personally convinced that it was an Old Testament hidden pattern of God’s family. However, this type even goes further than that to fulfill the Micah 7:6 patterns. God also told Abraham to leave his parents and go to a land that He would show him. This is again a hidden typology of the precise division found within the family of 5 with the 3 parents being divided against the 2 younger children. Again if you think this is coincidence it would be a mistake to think that way. In this typology Abram is the son and is a type of Jesus who left His Father’s house in heaven to come to the earth, the land that God would show Him. Terah (Abram’s father) is of course a type of God the Father who ruled the Kingdom of Heaven. Sarai would be a type of the Church, the wife of the Lamb of God and we will get into this in much more depth soon. As in every O.T. type and shadow everything in the story is not a perfect match. Abraham took his father with him until he finally died. The fact that Lot was also taken in disobedience was another fact that eventually did occur when Abraham and Lot finally separated. A shadow will always be a recognizable pattern with some details omitted. That is just how it works. Later, I will show you some other 5 things split 3 against 2 as a repeated pattern in some very strange and unusual places in the Bible. I will try to show you one of these in the next lesson and another one in a future lesson. Just remember that nothing in the Bible occurs by chance or accident and everything has meaning and significance. God says the thing that has been is the thing that shall be again and I believe this law is based upon the reality of repeated patterns that have occurred and that will occur again. We are just now beginning to understand many of them, but that is the nature of how God works. You may recall that I taught you the male members of the family were based upon the Trinity of God reality and that the Trinity contained the implied existence of females. But, let me briefly give you a synopsis of some other reasons that I believe that the male members in the Family of God are God the Father and Jesus, God the Son. One of the key rules that I always use to interpret the Bible, is to always allow the Bible to interpret itself. Because God is smarter than I am, I look for His meanings and definitions to help me understand what He is attempting to reveal. In other words I search to see if the Bible backs up what God says in other places. I always interpret the Bible using only the Bible and I do not search any other books, Bible lessons or commentaries for what some man thinks it says to justify my beliefs. If God does not confirm my beliefs with only His Word, then I change my beliefs to fit what He says. Otherwise I would just be teaching you my opinion and that would be worthless. From reading in Matthew 10:35 we should know that the Father and the Son are divided against each other. The Greek word translated as “father” in this verse in Matthew is G3962 and it literally means “the male parent”. Is this same word ever used to describe God in the N.T.? If it is not, my interpretation fails immediately. However, if you do a search using your computer, you should easily find that God is called by this exact Greek word title over 200 times in the N.T. In order to find these I did a case-sensitive search for the word “Father” and the Greek word G3962 to occur in the same verse. You can do the exact same thing if you do not believe me. Therefore, I have concluded that Jesus could have been literally talking about His Father God being the “Father” in Matthew 10:35, by direct and overwhelming scriptural word association. At the very least you cannot deny that it is not entirely possible based upon this overwhelming evidence. In Matthew 10:35 the son is called specifically a “man”. Therefore, we need to determine if Jesus is ever called a “man” in the Bible to confirm if this is also a possible interpretation. If we cannot find where Jesus is ever called a man, this would shoot down my interpretation categorically. The Greek word translated as “man” in Matthew 10:35 is G444 and it literally means “manfaced” or “male human being”. Was Jesus a male human being? Luk 12:53 The father shall be divided against the son, and the son against the father; the mother against the daughter, and the daughter against the mother; the mother in law against her daughter in law, and the daughter in law against her mother in law. As you can see in Luke 12:53, Jesus used a different word for this individual male and it says the father (G3962) will be divided against the “son” (G5207). Was Jesus ever called a “son” G5207? If you again search your Bible you will find over 80 Bible verses where Jesus is directly called both a “Son” and a “Man” (G5207 and G444) in the same verse. Again you do this by searching for both Greek words G444 and G5207 as well as the case sensitive “Son” all in the same verse, your results should match my results. Finally if you search the N.T. to see how many total times Jesus was ever called a “Son”, you can find over 200 times in the New Testament where Jesus is directly called a “Son” (G5207). Jesus is either called the “Son of God” or the “Son of Man” in more verses than I could try to name in this lesson. This is just more confirming overwhelming evidence for the identities of both of the male members of the Family of God. We can find scriptures that say God is a “Father” and we can find scriptures that say Jesus is both a “Son” and a “Man”. 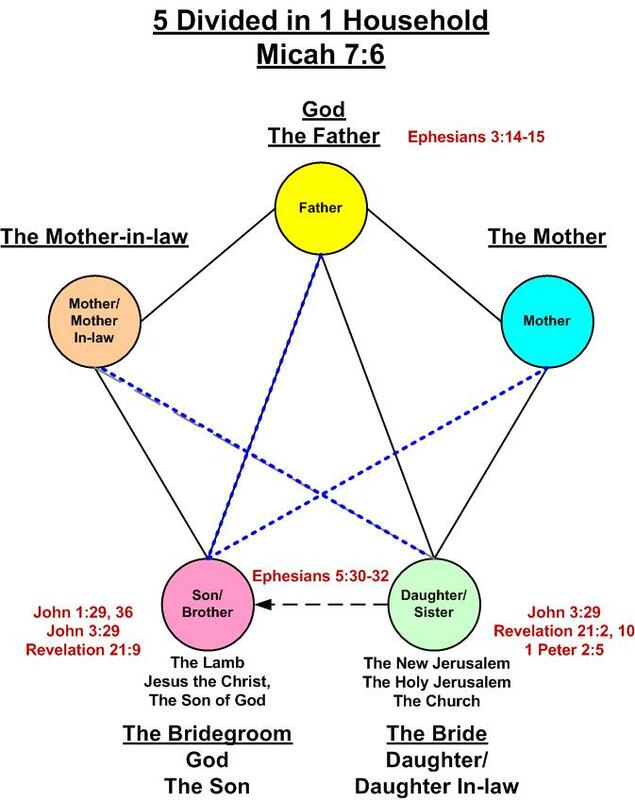 Again using this evidence it does not conclusively confirm that God the Father and God the Son are the two male members in the family of 5 that Jesus was describing to us, but it also does not rule them out to fit the interpretation either. Try to search the Bible and find another father and son combination mentioned over 400 times that fits with the exact same 5 family relationship titles. None that I searched for even came close. Father Abraham is only mentioned together in a total of 30 verses in the entire Bible. No other father and son dominate the Bible like God and His Son Jesus. The evidence is overpowering to me, but I’m sure we will come across some skeptics out there who can come up with reasons why they are not God the Father and His Son Jesus Christ. If is funny that God will always allow you to make the choice to be wrong. God will never prove anything in the Bible beyond a reasonable doubt. If God did that He would leave no one any freewill choice to believe or not to believe and God is not going to do that. You should be able to see that these verses clearly inform us that God the Father has or at the very least had a spiritual family. This verse further implies that God the Father is the Head of this family. In this verse we are told the specific location of this family and it is explicitly stated to be in two separate realms of reality. One is a spiritual dimension called heaven and the other is a physical dimension found here on the earth. Wow, that is very clear to me. God is also clearly stated to be the named and titled Father (G3962) in this family and Jesus is clearly implied to be the Son in this family. The implication is given that the family is very large in order to reside in the fullness of these two separate dimensions. I also want to point out that we are told that this family has God’s name. This is clearly self-evident that God the Father was the spiritual head of the household and that He is also the husband in a relationship with a wife in order to have a Son and to give them all, His name. 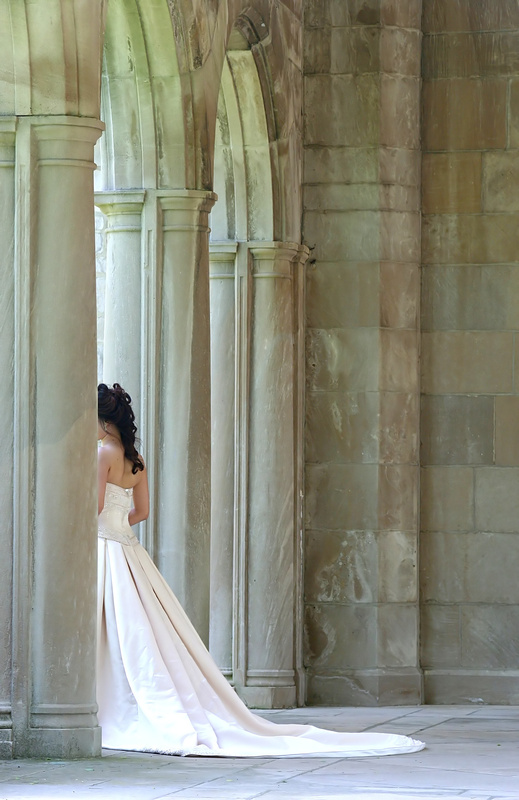 Taking the husband’s name during marriage is a standard practice and tradition originated from God, but it is often times ignored in the modern world. The modern wife sometimes does not always desire to take the name of her husband when they are married, but this is clearly not how God intended it to be. As if feminine of a derivative of G3962; paternal descent, that is, (concretely) a group of families or a whole race (nation): – family, kindred, lineage. Many times in the Greek language one word is derived from another word which is the case in this definition. Often times the gender of either a male or a female is also assigned within the definition and this is exactly the case for both the word GG3965 and G3962 that it is derived from. This Greek word has some awesome detailed information within it according to the Strong’s definition. The general definition is concerning children that have descended from their parents. But, also notice that the usage of the word is not limited to a single generation and that it can apply to all of the generational descendants. This Greek word is very much like a family tree diagram containing all of the family’s relatives in the lineage that originated from the specific set of parents. But, it actually goes way beyond that as you can see. This word G3965 can refer to the entire nation of people that have descended for example from a specific named man like a Jacob. This is another common pattern found throughout the Bible. You will see many men stated in Genesis that originated nations that were spread out over the globe. Almost any nation of people mentioned in the Bible can be traced back to the originator who was the father of them all. As you should know Jacob was the originator of the natural nation of Israel here on the earth. But, God changed his name from Jacob to Israel. Where did this name come from? Can this be the answer to my question earlier of what God’s name is that was given to his family on the earth? I believe that it is but I still can’t explain that fully right now. I will tell you that I am convinced that Israel is God’s name and we will learn more about why I believe that as we continue. I will tell you that the definition in Strong’s dictionary for the name “Israel” means “He will rule as God”. Now knowing the definition of the name “Israel” does that help you to determine who the name actually belongs to? Who will rule as God except for God? Please notice that this Greek word translated as “family” is said to be a feminine derivative of the Greek word G3962. This Greek word G3962 is the counter masculine reference to the male parent, so the “family” word G2965 is referring to a female family member only. Is this not the pictured pattern of creation and Adam and Eve? Doesn’t the Bible say that Adam came first and then Eve was formed (1 Tim 2:13) and that she was taken from Adam? Uh oh? It seems that God does have women in His spiritual family after all and that these women can be found both in heaven and on the earth. I also believe that God is giving you a repeated clue to where women come from in both the natural as well as the spiritual realms. They are always taken from the male. I firmly believe that the origination of all these things is from God who is concretely called a male throughout the Bible. But we also understand from reading 1 Corinthians 11 that there is a circular pattern within God’s creation. From the man came the first woman, and after that every new man came through a woman. Wow this is really deep. Nothing self-exists or created itself, except for God the Father. So if God describes a spiritual woman she must have originated from God the Father. But, we also understand that a woman can conceive and produce others like her, either natural or spiritual. I hope you are beginning to see that repeated patterns is a dominate theme found within the Bible. God uses these types of patterns because they work first, but also because we can learn about one and can easily apply what we learned to the others. When Eve was taken from the side of Adam, I am convinced that this was a spiritual pattern that existed before in heaven and that it is a further prophetical pattern to what will occur again. I know all of these assertions are very complex statements and I do not have time to fully explain them all in the level of detail that I need to today. If you are struggling with any of my statements, please be patient and continue to learn as much as you can and hopefully I will cover everything that I need to share as I continue. From a primary but obsolete verb νύπτωnuptō (to veil as a bride; compare the Latin “nupto”, to marry); a young married woman (as veiled), including a betrothed girl; by implication, a son’s wife: – bride, daughter in law. Rev 21:2 And I John saw the holy city, new Jerusalem, coming down from God out of heaven, prepared as a daughter-in-law (bride) adorned for her husband. Because God has used the exact same word from Matthew 10:35 and Luke 12:53, I believe that God is making a direct confirmation and a connection to who the identity of the bride is, in the family of 5. We can clearly see the connection based upon this titled commonality. Please recall that a commonality is a shared characteristic or feature of two separate entities. But, it also helps us in logical discussions to identify the same entity being spoken of in two different places in the Bible. If we can find enough shared attributes it makes it very easy to conclude that the one is the same as the other. When you are interpreting the Bible, these are the types of clues that you are looking for. You want to find shared connections that help you to establish the truth. God is a highly intelligent being and He never chooses His words randomly. Every word of God has a designed purpose and it is an intentional carrier of the knowledge, understanding and wisdom of God. However, God did not write the Bible in a simple text book style of writing with easily laid out facts and bullet lists of every displayed subject. God intentionally wrote the Bible more in a designed shotgun shell approach that spreads the information out in seemingly random patterns. God did this so that He could conceal the information until the time that it could be revealed. Let me briefly tell you about two laws of Bible interpretation that will hopefully help you in understanding the Bible. There is the Law of First mention that is used by God to help define a subject under discussion. You can go back and find the first time the subject is mentioned and you should be able to learn something that will help you to understand the entire subject. I use this law frequently in my Bible interpretations and it has never failed me. Conversely by the law of opposition or opposites, if there exists a law of first mention, there must also exist a law of last mention. It is exactly like if you are told about north you must logically assume there exists a south. If the law of first mention introduces you to a subject, then by the law of last mention, the subject must be concluded in those verses. So when I looked up the Greek word translated as “daughter-in-law” I immediately found the last woman with this title in the book of Revelation. Reading in Revelation 21 and 22 she is called this title of “Bride” 3 times and this is conclusive proof that this is the last woman that will be in covenant with the living God. Ok, I just taught you a bunch of stuff in one paragraph that is very important. I pray that you did not let it blow right by you. What I want you to see is that the bride or the daughter-in-law revealed in this verse in Revelation has a name and this is exactly what we are looking for to solve the riddle. We are intentionally trying to find the names of all of the women in the Family of God and here is the first name that is very important to learn about. I have taught on this subject multiple times in other lessons, so I will not repeat everything all over again, but I will try to hit the important points. The name of the woman is directly called “New Jerusalem”. That is a very revealing and important name. First off the word “new” is an adjective qualifier that separates this Jerusalem from every other Jerusalem. If I say “I have a new car” you immediately know that this car is not the same as my “old car”. I would have to omit the “new” adjective from the statement and say “I just fixed my car” or “look at my car” for you to understand that it could possibly be the same car that I already had. This is a fact that you need to understand completely. To qualify something means you have modified the meaning of the noun and limited the scope of it’s definition or you have restricted the definition by giving everyone a specific case exception. Do you understand this concept? If it was not important, I would not be asking you this question. If you do not understand this concept, please go and look up the word “qualify’ in an online dictionary and find the definition that I have given you and then look for examples of its usage and application. You can also explore the subject of adjectives and see how they are utilized within the English language. What I am trying to say is that the “New Jerusalem” is not the same Jerusalem found throughout the Bible. I do not know why this concept causes many Christians to get confused, but it does do that. The word “Jerusalem” occurs well over 700 times in the Bible and that is a lot of verses to analyze all of them. It is widely taught by many Christians and theologians that every verse that names Jerusalem is God speaking about the same natural city found in the middle-east today. However, I have discovered a greater truth found in the Bible and we must consider this new information in order to interpret these other 700 verses correctly. The first time “Jerusalem” occurs directly it appears to be in the book of Joshua chapter 10. It would appear reading down the chapter that Jerusalem existed prior to the nation of Israel possessing it. Interesting isn’t it? It would also appear that this city was inhabited by “Jebusites” prior to Israel taking it. It further says in the Bible that before Jerusalem was called by this name it was originally called “Jebus”. The word translated as Jebus means “trodden”. I could very easily get off the main subject and probably write you a book about the subject of Jerusalem, but I will not do that today. What I want you to embrace is a fact that the New Jerusalem in Revelation 21:2 is NOT the same city as most other places that Jerusalem is mentioned in the Bible. The natural city of Jerusalem in the Middle East today is not the city that is described to be coming down from heaven in this verse in Revelation 21:2. There are many reasons that I say that, but I do not have time to explain them all today. Another aspect that is essential to grasp from Revelation 21:2, is the fact that God says a spiritual woman is a “city”. This concept is very close to the definition of the Greek word G3965 where we discovered a woman could be viewed as a nation of related people. God uses a city as a symbolic representation for a far greater spiritual truth. The book of Revelation is covered with symbolic language and this helps us to understand the unseen spiritual things that are written there. This is also God’s way of giving you a definition without saying this is a definition. Since the city is coming down from heaven we must logically conclude that she is a spiritual representation and not an actual physical city. If you examine the Bible very closely you will observe this is another repeatable pattern found in some very unusual places. A city in the Bible is often referred to as a female, a mother, a daughter, a sister or a bride. For example, a city is again called a woman in Revelation 17:18. However, this woman is named “Mystery Babylon the Great” and she is called the mother of whores. I could give you many more Bible examples of a city being described to be a woman, but I believe I have made my point. This city in Revelation 21:2 is also called a “Holy” city and that again disqualifies all the other cities with the same name that do not possess the “holy” attribute. These are not hard concepts to grasp; but they are difficult for many religious people to accept because they have been taught wrong. It is many times very difficult to overcome the false doctrines of men because most of them were never taught to intentionally deceive people. Most preachers who teach in error do so out of ignorance and not for intentional evil deception. Many very good Christians have taught erroneous doctrines and totally believed they were true. I guess I need to get back to my main subject. Let me briefly try to explain exclusion using qualifier words to separate things. If I have 5 cars parked in my driveway and I hand you some car keys and say go drive the “blue” car to the store and buy us some food. With this verbal statement, I have excluded every other car that is not blue. You immediately know that the keys that I just gave you do not fit or start the red car, or the green car, or the yellow car or even the white car. This is what God is doing with the adjectives of “New” and “Holy” and He is describing to you a “city” that never existed before and the keys that He has given to you only fits this “new holy” city. God has linked a “bride” and a “daughter-in-law” directly to a city named Jerusalem and God separates her using two evocative adjectives of holy and new. By the law of opposition or opposites, we understand that this means this bride is not the unholy Jerusalem and neither is she the old or the previous Jerusalem and that is some very powerful hidden information to who the other two women are in the family of God. But we will not get to them until later as we continue to learn. Remember the prophecy of Micah 7:6? It says the daughter will be opposed to her mother and the daughter-in-law will be opposed to her mother-in-law. These are exclusionary acts of God being stated. Since the New Jerusalem is both the daughter and the daughter-in-law we must logically associate that a division is occurring between that which was unholy and that which was old from this newly revealed bride. A separation is occurring of one woman from two other women. God is separating one new city from two other cities. God is separating one new covenant from two previous covenants. Wow, I’m not sure if I should have told you that yet. Hang in there and I’ll prove it all later. Let’s define the word Holy to see what God is saying to us. From H6942; a sacred place or thing; rarely abstractly sanctity: – consecrated (thing), dedicated (thing), hallowed (thing), holiness, (X most) holy (X day, portion, thing), saint, sanctuary. From ἅγοςhagos (an awful thing) compare G53, [H2282]; sacred (physically pure, morally blameless or religious, ceremonially consecrated): – (most) holy (one, thing), saint. Here are definitions for both the Greek and the Hebrew words translated as “holy”. There are many words here that are relevant to see. To sanctify or to consecrate are both concepts that means to set apart. Again we have the concept of division occurring. It is funny how God repeats patterns in the Bible over and over. The word sanctify comes from another word that means “to make clean”. I cannot personally read any of these definitions and not think of myself and the rest of the church of Jesus Christ. In the Word of God it is the church that are called to be as saints, we have been sanctified and set apart, bought with a price and we were cleansed by the blood of the Lamb. The only “holiness” that humans possess is that which has been freely given to us by the grace of God. However, this free gift of righteousness qualifies us for being holy. I feel very confident that the Church is scripturally qualified to be this Holy City called the New Jerusalem, but we will get more confirming witnesses to help you see it. Why does God call the church a “Holy Nation of people”? These are all spiritual names, titles and descriptions of us His new Bride. This bride is however a spiritual woman in covenant with Jesus now. We therefore as a holy nation of people qualify to be the city that is named Holy Jerusalem. I sure hope you are getting what I am teaching today. If you do it is going to help you more than I can say. Once you understand what I am teaching you will know who you are in Christ and what your position of responsibility is in His family. You may continue to read down in Revelation 21 and see two more references to the Bride of Christ that I do not have time to go into today. They basically say the same things that we have already said, but they give us a second witness to the name of the new “daughter’-in-law”. In Revelation 21:9 we are specifically told the husband is the Lamb of God and this connects Jesus to be both the groom and the son in the family. As I continue through this series you will soon begin to see a pattern of cities, women, and covenants that are repeated. The transition will be from spiritual to natural and then back to spiritual and I wish you knew what I knew to understand that statement. Just keep it in mind as you continue to learn. Hopefully you can see what God is saying in this verse. God is not building a natural building, the city location in Revelation 21:2 was purely a symbolic reference for a greater spiritual truth. We are the living building blocks for God’s new dwelling place. The word translated as “house” is a Greek word G3624 that means “a family”. There are many implied meanings to these words. God is building a New Family structure to replace the old family structure. You could also say based upon what we have learned God is building a Holy family structure to replace the unholy family structure. God qualifies this family to be a Spiritual House and a new Family and that means it is not a natural one or even one that ever existed before. The spiritual dimension is an unseen realm of existence to us presently here in the natural realm. I also want to point out that this New Family being built is associated with Jesus Christ, the Bridegroom, the Lamb of God, the Son of God who is our covenant husband. Let’s shift our focus on another reference of Christ and His Bride found in the Bible. If you read the fifth chapter of Ephesians very closely you will discover that God is speaking about a dominant subject of marriage in relationship to husbands and wives. Now remember that a wife is always a daughter-in-law so this chapter applies to our study. God talks about this natural subject and says many words of instruction for our benefit. However in this chapter God has intertwined a spiritual reality that also applies to us the church. God then ends the entire discussion with a bomb shell unveiling of a great mystery. Since we are studying about the bride, the daughter-in-law and the marriage to the son we must conclude that this chapter is specifically related to information that we need to understand about our subject. If you read down the entire chapter you will see many things being intermixed between natural things and spiritual things. The natural husband is instructed how to treat his natural wife and the natural wife is instructed how to treat he natural husband. But, during this discussion, God is also speaking about Jesus and the church using the exact same terms. Finally when you get down to verses 30 through 32 God reveals that this is a great mystery and that He is telling us that Jesus is married to His wife the church. If you do not understand this I have many other lessons that go into this in more detail. We have basically seen enough witnesses to confirm the identities of at least 3 of the main family members in the family of 5. So I’ll give you most of this information in a synopsis picture format so that you can see it more clearly or at least visually. You may not still know who the mother is or who the mother-in-law is, but we will discover those two women in the next lesson hopefully. I know I did not give you every scripture that I could have in order to limit the size of the lesson. So if you would like to understand more of the details about the Bride of Christ being the church you can go read my lesson series called “Understanding the Bride of Christ”. Also read my series called “Understanding the Book Ruth”. You see in the book of Ruth, she is specifically called a “daughter-in-law” and since there are not that many women with this title given to us in the Bible, she must apply to the church as an Old Testament typology and her husband must also be a type of Jesus. Hopefully you know that her husband was Boaz and that he is called the Kinsman redeemer. All of this information fits with us the Gentile church (Ruth) and Jesus Christ (Boaz) our redeemer with amazing accuracy. I think I have gone long enough for today and we will continue in the next lesson to identify the other women called the “mother” and the “mother-in-law”. I hope and pray that you are learning with an open mind. I know it is totally new to you and I know it is complex beyond our imagination. I have been attempting to teach it in concise chunks that are manageable while attempting to simplify the subjects as much as I can. Hopefully after I finish the next two lessons in this series you will have sufficient knowledge and understanding to be able to share it with others. Thanks for taking the time to study the Bible with me and may the God of creation continue to bless you tremendously in your inner man to give you the spiritual eyes to perceive what He wants you to know. Until next time continue to fight the good fight of faith. If you would like to continue reading in this series, you may go to “Part 7” now! Posted on June 14, 2011, in Bible Study, God's Spiritual Family, Understanding and tagged Bible, Christianity, Church, Covenants, Family, God, Jesus, Knowledge, marriage, Prophecy, Religion, Revelation, Truth, understanding, woman. Bookmark the permalink. 1 Comment. I’m learning as fast as I can. I’m 68 years old and I’m sure glad that I stumbled onto this blog. I am praying that I remember every thing so that I can impart to my daughter and her husband and subsequently my three grand children. I am not making notes as yet, because I am so anxious to absorb these teachings. I’ll go over the lessons again to make notes, may God continue to bless and teach you, so that you can teach us. Please continue posting if only for one soul (me). Not many Pastors teach like you do. There is one guy in my country who tries to teach this on a radio programme every Thursday night, his programme is called “Knight Watch”, a church without walls. Reading it from you It is becoming so much clearer. I am also praying and fasting for my eyes , ears and understanding to be opened before I leave this earth. I always had so much difficulty fully understanding, finding you has to be a work of God. The brother on the radio in my country also gets a lot of negative remarks from some listeners his reply is “If you cannot run with the horses, just turn your radio off”. I repeat All God’s riches blessings to you.